We had a fun meeting last night, the 10 members and two guests, one who decided to join! First, there were some announcements. We need volunteers to present a BOM, each month. Sign up with Suzanne. We have a Pinterest account and a board featuring 12” blocks. The good news is we have presenters through August! If you are making green heart blocks for New Zealand, I’ll collect them at the April meeting and get them in the mail. The instructions are on our FB page and the blog under Tutorials. Next month we’re going to have something new, a FREE table! 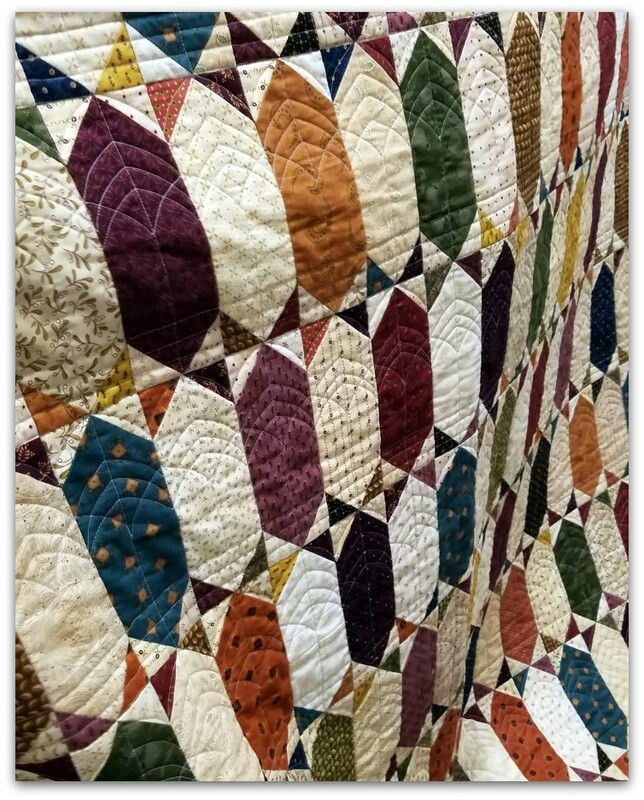 • Free things should be quilt related, or books, fiction or non-fiction because quilters are readers. • Any leftovers can be picked up by the donator, or it will be donated to charity. Non-books to Goodwill, books to Murrieta Friends of the Library. 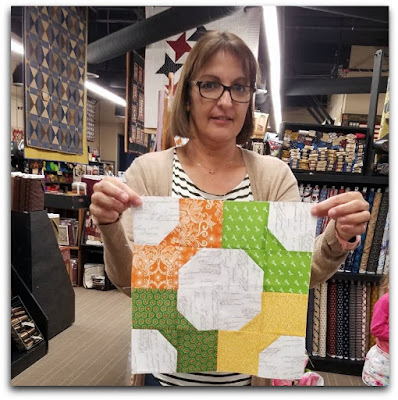 Susanne presented the new Block of the Month, due at the April meeting. It's called Mini Bowtie. Then we had Show and Tell, my favorite. 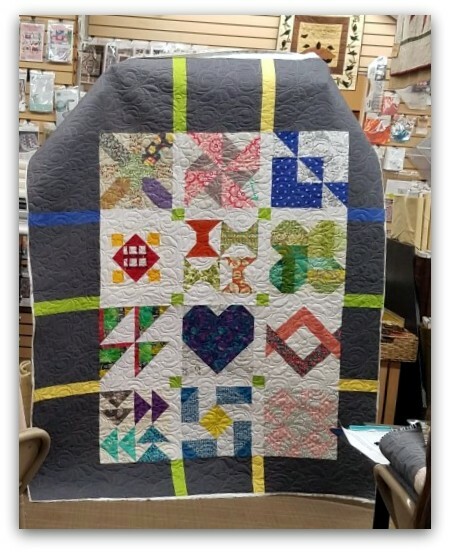 These two are "Sampler Quilts". 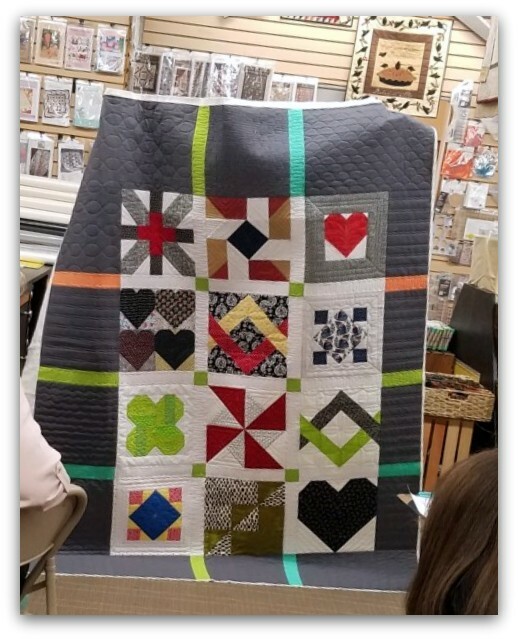 I made them to show the guild my idea for our new batch of charity quilts. These use 13 BOM blocks instead of 12 but are easier to assemble. I think they liked the idea. 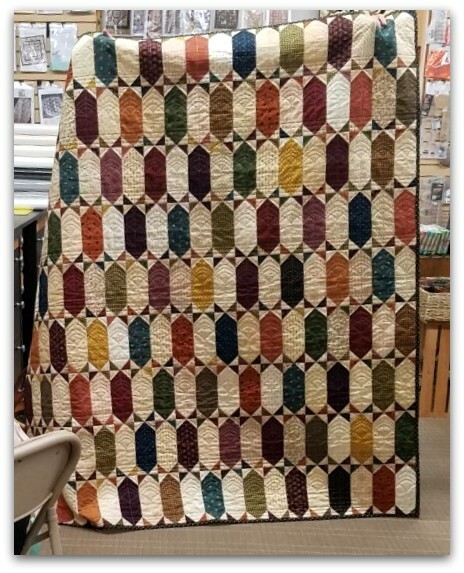 This is a baby quilt I made using leftover blocks from a previous quilt. 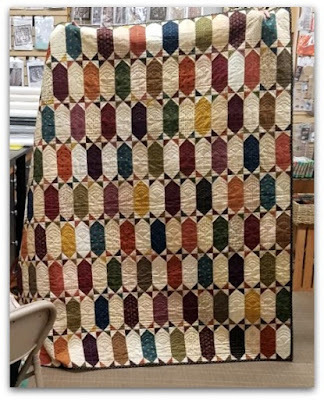 Next up was Judy, she also had three quilts. The first two are from the last batch of Charity Quilts that will go to Thomas House Family Shelter. These are wonderful! Toni volunteered to take them home, square them up and attache the binding. What a team. This is Judys' personal finish. The quilting on it is fabulous. Don't you agree? Toni made some wine bags as gifts. 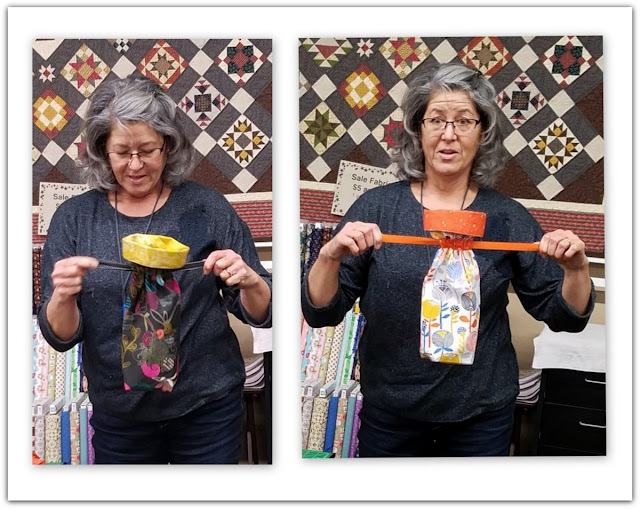 She said she hopes the recipient will re-gift them to someone else, with a bottle of wine; but she's sure her friend will not part with them, so she discussed alternative uses for the wine bags. We spent the rest of the meeting sewing and I didn't take any photos. We made a total of 20 placemats using some 12" BOM blocks and additional fabric. While we were very productive, a couple of members took home some kits to make more. They'll bring them back next month and all the placemats will be donated to our local Meals on Wheels.